We know life is busy. Sometimes the easiest way to plan for your day is when you’re sitting directly in front of your computer. 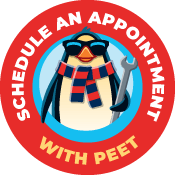 If heating or cooling issues are causing added stress at your house, schedule a service appointment right here—online. Our qualified technicians are only just a click away.